Company announces expanded suite of services with detailed guard tour system, security alert service and sponsorship of Dispax World 2014. Security programs built to address the access of aircraft services and possible behaviors, which could be indicative of a problem, are excellent approaches to delivering a comprehensive aviation security management system. Global Elite Group creates an easy to use aviation security solution designed to complement the flight handling process with an access control system called SecureSwipe™. Easily deployed and portable, SecureSwipe™ is a hand-held unit utilizing a bar code, magnetic strip and RFID reader at all access points. As a portable access control system, SecureSwipe™ is a truly mobile access control system that also services as a guard tour device. This technology is used for all persons looking to gain access to an area in and around aircraft and monitoring the flow of personnel. SecureSwipe™ provides enhanced security measures through real-time verification of critical areas that need access by workers and limits access to those who shouldn’t be there. “Aviation management requires a critical eye to identify where vulnerabilities are, that must be addressed. Having a unit which tracks and records where workers go will accomplish this goal,” stated William McGuire, President & CEO, Global Elite Group. Improved aircraft turnaround times, regulatory compliance and data accuracy are just some of the enhancements GEG’s SecureSwipe™ was designed to address in a single system. GEG is committed to bringing technology into all areas of aviation operations where it can truly be a benefit. 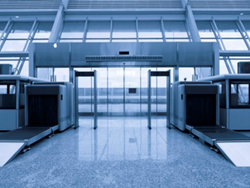 Specifically designed for the aviation industry, this security platform improves basic entry security including the outside entry points through the use of documented activity. While recording critical information related to access, the system also serves as a guard tour system to record the operator’s location and activity. SecureSwipe™ will also submit incident reports based on inspection routes while working with a central database to generate detail reports on inspection activities. “There are cost savings benefits for the airline in time saved with this platform while offering a streamlined approach to security,” explained Victor Anderes, Executive Vice President, Global Elite Group. Additional support services for the aviation industry include a security alert service with information gathering from industry alliances, other security associations and open source information from around the world. GEG’s weekly Aviation Security (AVSEC) Newsletter is the only one of its kind and has received recognition for its specific focus on the subject matter. SecureSwipe™ is part of the GEG suite of product and service offerings to assist airlines in managing access to aircraft. “Technology is a great tool in keeping the aviation industry safe but other human skill sets are needed as well. Understanding the human behavior component in the safety process will help to mitigate threats,” states Anderes. GEG is an active sponsor for the upcoming industry symposium Dispax World 2014 a security meeting being held in London June 10-11, 2014 to address airline passenger behavior. Security programs built to address the access of aircraft services and possible behaviors, which could be indicative of a problem, are excellent approaches to delivering a comprehensive aviation security management system. Because the program is continually updated, it has proven to be an effective tool for a both security solutions and compliance. SecureSwipe™ and the suite of services offered by GEG have been created to meet the increasing demands of the transportation industry. Today, GEG supports over 35 airlines globally with leading edge technology addressing all areas of security management, control and accountability. About Global Elite Group: With offices located throughout the world, the company provides security and emergency management services for companies of all sizes and is known for its emergency contingency planning in all markets and its aviation security programs for over 35 airlines located in the U.S. and abroad. The company is always expanding services to compliment the security needs of individuals, companies, high profile travelers and events. The company is TSA certified to provide screenings to individuals and groups. Global Elite Group is a full-service event security management company with security details available for deployment to cover small venues to large-scale multi location events. Other services include risk assessments and asset protection.